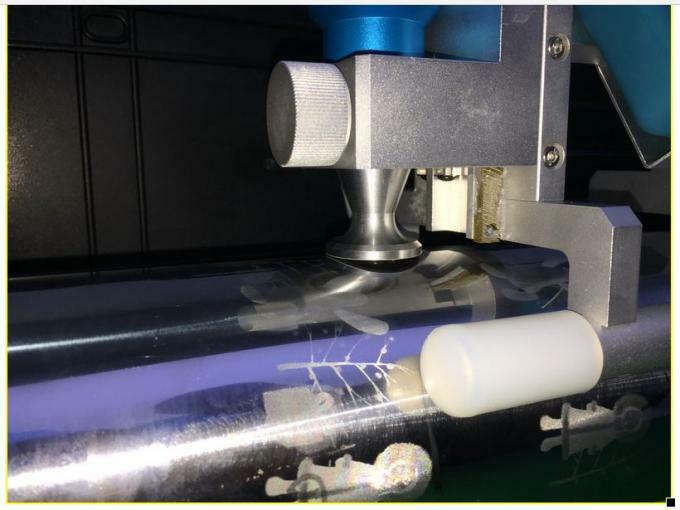 Rotogravure cylinders is an important component in printing equipment, it can directly effect the quality of printing quality, In direct gravure printing, the ink is applied directly to the cylinder and from the cylinder it is transferred to the substrate. Rotogravure cylinders inner metal rolls are engineered and constructed of double-shell forged steel or chilled iron to maintain a uniform roll-face temperature, with a profile variance within 2°F (1°C) while operating at up to 500° F (260° C). Metal rolls are available with many options, which include: Nickel or chrome plated, Release coated, Precision ground, Heated or cooled, Hardened (case or through), etc. 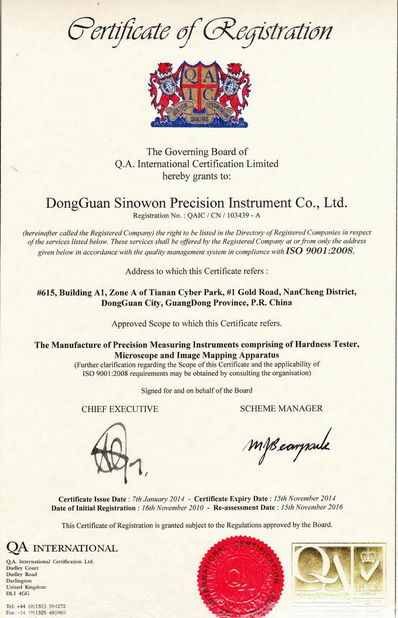 To determination copper respectively chrome hardness of rotogravure cylinders simply, fast and accurately, UCI Hardness tests in Vickers range of light weight have the advantage that they are supposed to be non-destructive as the lasting surface indentation is microscopically small. Measuring is effected by Vickers penetration procedure by ultrasonic evaluation of the indentation (UCI process). 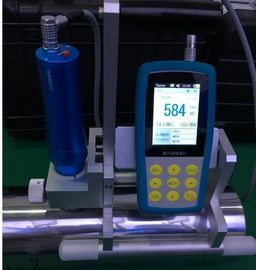 Different instrument adjustments (calibration values, penetration times, tolerance thresholds) for various metals can be stored in the device (e. g. copper, chrome, steel, zinc). A transfer to PC via Bluetooth or USB interface for long-term storing is possible on a very easy way. The measuring values and the current average value are shown simultaneously and judged (cross means poor value) on the display in Vickers hardness HV or converted to others hardness scales. Furthermore, the whole measurement-series (statistic results, single measurement values) can be displayed at a glance. Perfect Accuracy--±3% HV, ±1.5HR, ±3%HB. Microscopic Indentation-- Only high-power microscope can observe the indentation. Quick Measurement--Result in 2 seconds. 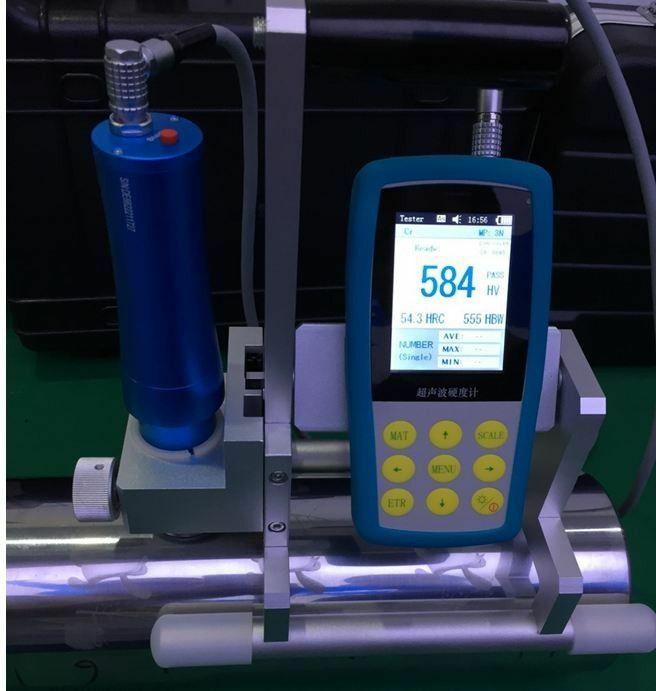 Large LCD Display--Directly display measurement result, times count, maximum, minimal, average and deviation. Friendly Operation--Operate well after short training. 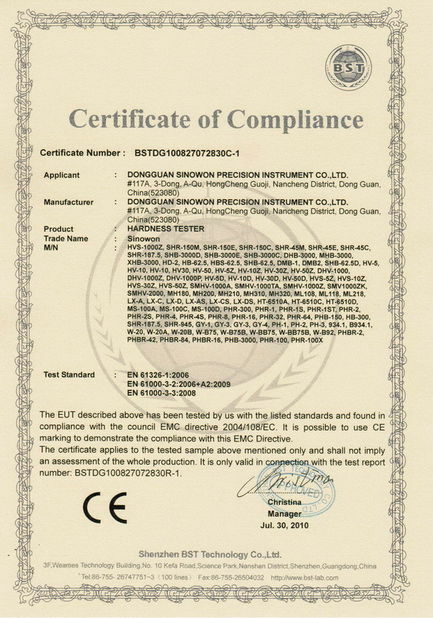 Promised Warranty--2-Year warranty for main unit (Excludes Probe). Mass Storage--Save 1000 groups measurement data.